1. Soak sausage casing with warm water till soft. Fix it to water tap and rinse until clean. Drain. 2. Wash and slice pork fillet to about 1 cm thick pieces and pork fat into 1/2 cm thick pieces. 3. Place sliced meat into a big bowl. Firstly, add in the saltpeter solution and mix well. Next, add in the rest of the ingredients and mix thoroughly. Leave to marinate overnight. 4. Tie off one end of sausage casing, attach a funnel to the other end and gather sausage casing on funnel tube. Stuff marinated meat into casing. Squeeze to distribute filling evenly throughout the casing. When it is about 12-15 cm long, cut it off and tie with a raffia string. Prick generously on all sides of sausages to expel air. 5. Boil a pot of water. When boiling, put in the sausages to scald it. Remove and hang outside to dry or in a well-circulated area for 4 to 5 days. 6. Sausage may be steamed, deep-fried or baked, all over low heat for about 8 minutes. To serve, slice into paper-thin pieces. BTW, where I can buy Chinese rose wine? ( I’m living in the US). What can I use to subtitute? Do we need to put red color so that the lap cheong looks red in your picture? 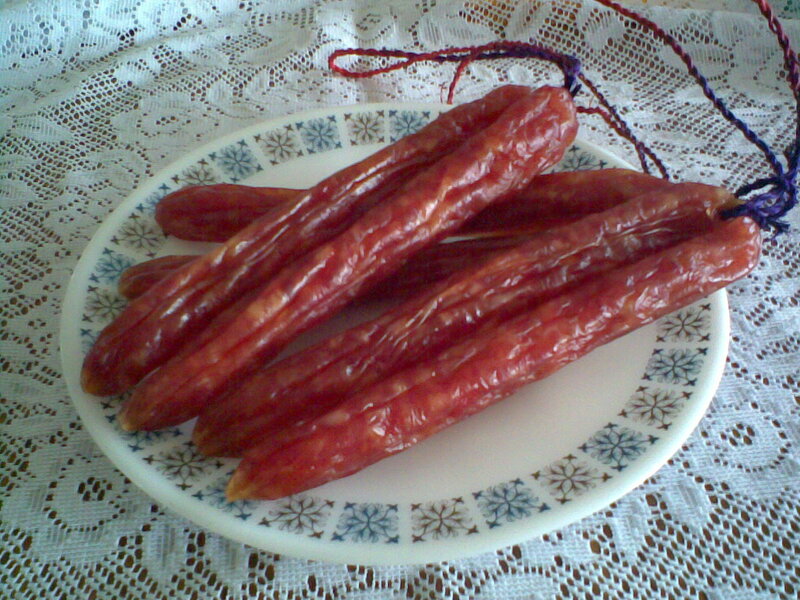 The picture shows a commercially prepared Lap Cheong which we can get all year round. You need not add the red colouring. 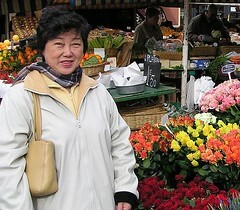 As for the Chinese rose wine, try and see if you can get it from the chinese shops in Chinatown, NY. If not, you can substitute with scotch or sherry for flavour. I think it would be better to hang them to dry in a warm place than leaving them in the open for few days. Thanks very much Rose, I will definately make it and let you know how it turns out. Was wondering if you have any pictures of your homemade lapcheong? I just wanted to know what the homemade end-product looked like. Many thanks for all your recipes! I was wondering what is saltpeter? I haven’t heard of it before and was wondering if it goes by another name. Saltpeter aka Potassium nitrate aka E252 – In food preservation, potassium nitrate has been a common ingredient of salted meat, but its use has been deprecated. In this time it’s quite difficult to obtain it even through Pharmacist due to its nature been used not only as fertilizer but also in… explosives (if you know what I meant.) It’s also used in pre-rolled cigarettes to maintain an even burn of the tobacco as well as in toothpaste for treating sensitive teeth. when you say scald the sausage, how long my I supposed to dip in the hot water? Can I turn the fan on low and hang dry it? Will be trying your Kueh Lapis next! thank you for all the information! It would be a good idea to dry it using a low oven. I once made some waxed meat and left it to dry in the sun for few days but when I saw maggots coming out of it I threw them away. Our country is so humid and dusty, not very practical. Thanks for the kind reply, Rose. I had actually done the waxed meat in a low oven using pork belly marinated in sugar, soy sauce, scotch, and a little 5-spice powder. I understand that you live in Malaysia, and the climate here in Manila is pretty close to what you experience in Malaysia’s sea level urban areas. I’ve been to KL a couple of times in the past. Loved the food!! i enjoyed your lapcheong recipe. It was truly an experience trying to make my very own! I was also wondering, do you have any recipe concerning waxed duck making? It would be a pleasure to try out! Thank you! I will post the recipe for the waxed duck. As for the lap cheong it is quite hard to get the casings so I don’t bother to make them. Would appreciate if you could share your experience when you try out the recipe. Wonder if you’d posted the waxed duck recipe as I couldn’t seemed to find it? Shall be grateful if you could please kindly notify if it is listed under which heading of your recipes categories? Thank you, Rose. My grandmother used to make lap cheong but we lost our recipe with her. I’m excited to try yours! I notice that you haven’t posted very much of late. I hope you’re still around, in the kitchen, and writing. I’ve just discovered your blog and I love it. Plus you are too adorable! Keep up the great work! I’m having difficulty in buying Lap Cheong from my Chinese shop. Can you recommend a website where I can buy online. Hi Sally. I like to buy Dollar brand Chinese sausage when I visit my parents in Vancouver BC. It’s a Canadian brand that’s distributed in Canada; I’ve also seen it in a lot of Asian groceries in the US West Coast. Even as far inland as Las Vegas. Thank you so much for sharing your recipe for Lap Yoke and Lap Cheong. I’ve been looking for a way to make Jeone, Chinese Tamale, but didn’t want to use the store bought Lap Cheong because of the additives, dyes and MSG used to make them. I have read that nitrate and nitrite, used in curing meat, are known to cause cancer by four fold. Now because I have found your recipe I can make my own Chinese sausage, except I will omit the saltpeter. Salt, sugar and soya sauce are all natural antibacterial agents and I can store the cured meat in the freezer until I use them. It’s very frustrating that all commercially produced food items are so loaded, first with pesticides, then dyes, preservatives, artificial flavoring and coloring that no wonder, everyone has a chronic disease. How do I make it without the lap cheong casing. you buy lap cheong casing…either natural or soy based from your local butcher or even ebay. Rose i did follow your recipe and my lap cheong taste more salty than sweet…I would say he taste like salami is that this type of Lap cheong than yours or he must taste salty?